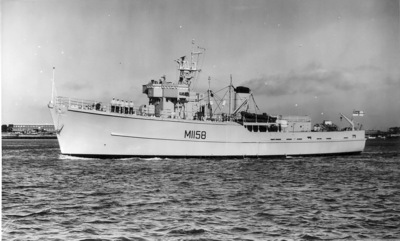 The sun was still high in the sky one summer afternoon in the early 1970s as the Ton Class ship crossed Lyme Bay on passage from Portsmouth to Falmouth. With one Mirrlees engine shut down for economical steaming, the other thumped out its steady rhythm, producing a lightly coloured plume of smoke that rose almost vertically from the funnel before flattening out to leave a wispy low-lying ribbon astern. The Captain, a feisty Scottish MCD officer, relaxed in his chair on the open bridge and chatted to the OOW as the ship ploughed westwards across the gently rolling sea. The lengthening string of 15-minute fixes on the chart showed the ship maintaining her track and the OOW was thinking that it was about time to rub out the older crosses but what a pity it would be to destroy such a neat pattern. Gradually, a slow moving smudge ahead of the ship materialised into a fishing vessel engaged in recovering his nets. More details became apparent as the two ships closed. The OOW had already reported the vessel as having a Closest Point of Approach (CPA) of six cables on the port beam and his forecast was proving correct. Through their binoculars, both officers were able to read the registration number painted on the port bow of the fisherman: 'CN 133'. "No need to look it up in the Fishing Vessel Log," remarked the Captain in his distinctive west of Scotland lilt. "CN means she's from Campbeltown," he stated with confident finality. "But what’s she doing so far from home?" As the fishing vessel came up on the port beam, her industrious crew could be seen moving with even greater bustle as they redoubled efforts to haul in their gear. "I wonder what they've caught," mused the Captain. "A wee bitty fish would certainly help the victualling fund. In fact, tell you what....stop the ship and have the gemini coxswain come up here for a brief. Oh, and pipe for the steward," he added as an afterthought. "He'll have to find a bottle of Glen Morangie to barter with. We'll have fish for supper yet." Five minutes later, the ship was stopped and drifting idly within a few cables of the fishing boat where activity had reached a crescendo as the crew man-handled nets and lines with unseemly haste. While the steward went oft in search of a bottle of whisky, the gemini coxswain received a brief from the Captain. The duty gentleman happened to be an AB known as ‘Dutchy,’ actually a South African who had been born in the Netherlands. 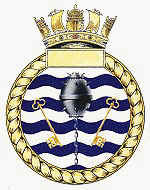 His main claim to fame was in being the only qualified Seacat Aimer in the MCM Flotilla, a fact he let few ignore or forget. His command of English was passable but his speech was rendered almost incomprehensible by his thick accent. ‘Dutchy’ was instructed to approach the fishing vessel, making sure to keep well clear of any trailing lines or nets, and then to pass the bottle of whisky up to the crew. It the crew wished to express their gratitude with the offer of some fish in return, he was to thank them politely and return to the ship with his gains. During this evolution, he was to keep in touch with the ship using his VHF portable radio. The gemini was lowered and sped away from the side taking 'Dutchy" and his bowman towards the fishing vessel where, by now, the frenzied activity seemed to have reached absolute panic stations. The crew resembled clowns in a circus act as they slipped and fell about dropping items in their desperate efforts to recover their equipment. From the bridge of the Ton, the Captain could see the gemini dinghy lying a few yards off the fishing boat while the coxswain engaged in earnest conversation with one of the fishermen. The radio crackled into life with ‘Dutchys’ distinctive guttural tones. "Mother this is gemini. They seem to be talking in a funny language, Sir... over." The Captain leapt across the bridge and grabbed the radio impatiently. "Of course they sound as though they're talking in a funny language. They're from the West Coast of Scotland, dammit! Give them the whisky and ask if they can spare any fish." "Roger, out," came the distorted reply. Through the binoculars, ‘Dutchy’ was seen to pass the bottle to the fisherman and, after a short pause, was rewarded with a small sack in return. The VHF crackled back into life: "Mother, this is gemini. Returning to ship now." 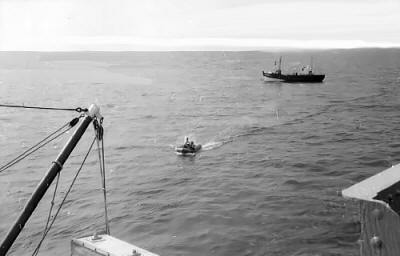 Eventually, the gemini was recovered and the ship resumed her passage leaving the fishing vessel wallowing far behind. By then, we had discovered the small amount of fish received was either under-sized or rotten and inedible. The Captain was in a foul mood muttering how he had been let down by his kinsmen. That evening, I found myself talking with the Junior Seaman who had been the gemini's bowman and was an intelligent lad. "They were French in that boat, you know," he confided. "They were from Caen, not Campbeltown. I saw it painted on one of the boxes." I thought of the panic that must have been felt on board the French fishing vessel caught in the act of poaching in UK waters as one of Her Majesty's warships hove over the horizon. I imagined their horror as a boarding party was sent across to confiscate the catch, arrest the crew and possibly impound the vessel and I visualised their bewilderment when, instead of being arrested, they were offered a bottle of expensive whisky in return for a bag of third rate illicit fish. I thought of their relief as they saw us continue on our way and I pictured my generous-hearted and noble-minded Captain’s reaction when he learned the truth. I struggled to keep a suitably professional expression on my face. "Leave this with me," I told the young sailor. "I'll handle it from here."